Ever since the days in school Mid-Side (also refer to as MS) has always been a mysterious recording technique, almost like some weird voodoo! I remember one of my college professors showing us the Fostex M22RP Mid-Side microphone. This was also my first introduction to ribbon microphones. M22RP has always been one of my favorite vintage microphones ever since the first time I plugged it in and heard it. I don’t remember too many students checking out the M22RP; this was probably due to the fact that it was a mid-side microphone which involved a somewhat intimidating method of decoding to us students at the time, oh and it was a ribbon. Although, surprisingly my friends were always so amazed that the M22RP could produce left, center and right signals and a very pleasing to the ear wide image. Mid-Side also has a lot of benefits over other recording techniques like XY, AB, ORTF etc… When you record raw MS you have many options available when decoding. A basic raw MS recording will produce a mono compatible (center), stereo (LR) and left, center, right (LCR) recording. Additionally, adding a third rear facing microphone to the array can produce a quad (L,R,Rs,Ls) and a 5.0 (L,C,R,Rs,Ls) recordings after decoding. This is very useful when recording ambience and as I stated above, it gives you many options for decoding of two channel MS and three channel D-MS. During setup you adjust the width of the stereo image by increasing the amount of the side signal or decreasing the amount of the mid signal. Be careful. These adjustments need to be made prior to recording to ensure for a consistent decoding. At this point I will take a break to talk about field recorders. There are quite a few field recorders on the market. It is a important step to take the time and choose the field recorderthat fits your needs and your budget. Some field recorders have features dedicated to Mid-Side recording in particular the Sound Devices series 7 recorders. These recorders allow to you add MS decoding directly into the path monitors, which preserves the recorded files for greater manipulation after recording. This makes the 7 series a very good choice. Although there are other recorders on the market that have these features. 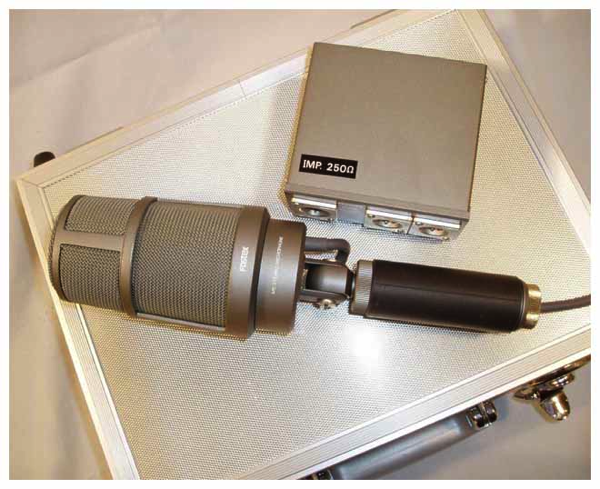 When it comes to microphones used in MS set up, there are numerous options available. Brands like Sennheiser, Neumann, Schoeps, Audio Technica, Shure, Ambient Recording etc… all have options that will fit into a MS setup. Ideally you should choose two microphones of the same brand and moreover, have a matched set. That would be ideal, but in a real world you may not have this luxury. I am a huge fan of using what you have and making the best out of things. It is not a crime to mix and match and if that is what you have to do, go for it! Occasionally you get results that are beyond what you thought you could achieve. My personal setup is a double mid-side rig. Double mid-side just adds a rear facing microphone and produces up to 5.0 (L,C.R,Ls,Rs) surround recording. My setup consist of Neumann KM100 series microphones. In front I run a KM150 (Mid Channel) forward facing hyper cardioid. Followed by a KM120 (Side Channel) side address or figure eight and a rear facing KM140 (R Channel) with a cardioid pickup pattern. The setup will vary depending on what I need to capture. The reasoning behind why I use the KM150 in front is because of the level of directionality. Given the greater off axis rejection of a hyper cardioid vs cardioid, you achieve superior isolations and less overlap of the wide lobs of the KM120 side channel. 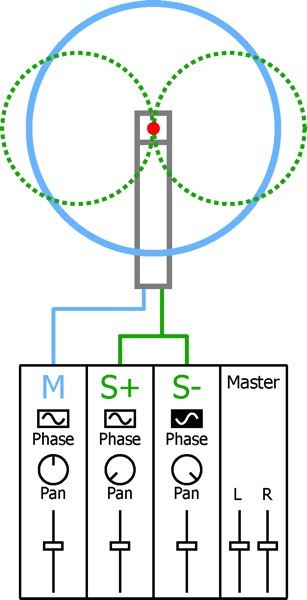 In general, the narrower pick up pattern a will result in more dramatic movement in the sound field when recording MS. Hyper cardioid will also have a greater proximity effect then cardioid because of the focused pickup pattern. If less movement is needed, I will choose a cardioid microphone over a hyper cardioid microphone since cardioid exhibits less proximity effect, thus not exaggerating distance in the sound field. Picture of my Neumann KM100 DMS (double mid-side) setup. before i tucked the rear facing cable to install in the Rycote. The result of cardioid exhibiting less proximity effect in the rear channels will have a decreased amount of directional movement. Normally you do not want a lot of movement coming out of rear surround channels since it would be distracting to the viewer. 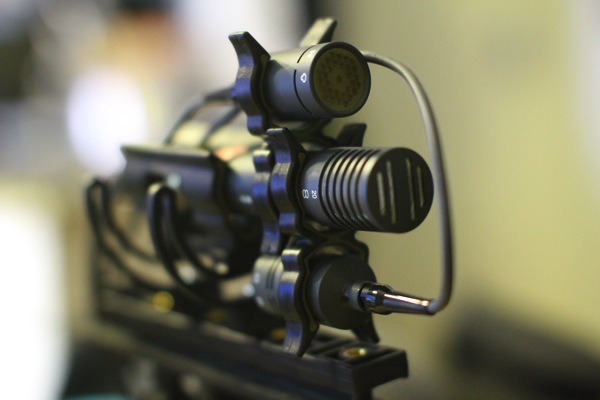 This makes cardioid an ideal choice for the rear facing microphone. In part 2 I will go over the basics of decoding and processing of MS recordings. The goal of this recording was to demonstrate how objects move dynamically from speaker to speaker. The recording location was in Los Angeles just outside of an underpass. While the M&S mics were pointed away from the underpass the rear microphone was pointed into the underpass. When listening in 5.0 you will hear dry signal from the forward facing MS elements and a reverberant signal in the rears, demonstrating the results you can achieve from MS or D-MS. Please also note: besides decoding, no other processing has been performed on this file. Below you can find sample decoded D-MS files. Since the files have already been processed you will not need any special software or plugins to playback the files. I recommend listening on a 5.1 system.